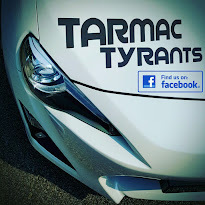 TarmacTyrants: ERP Rates and Gantries, Intuition or Apprehension? ERP Rates and Gantries, Intuition or Apprehension? As per the recent article published on the 14th February in the local papers of Singapore, the public had been informed that 2 more Electronic Road Pricing (ERP) gantries leading to the Pan Island Expressway (PIE) will be activated in the evenings from next Monday while the current evening operated gantries on the north-bound rote of the Central Expressway (CTE) will have its rates hiked by S$1 during evening peak hours from 20th February. Based on my current travel patterns, I am already paying an average of S$6.00/day on ERP tolls just to get my daughters to school and home for dinner. So believe me when I say that I am not at all enthusiastic to be charged another dollar more. My heart goes out to all affected Singaporeans. 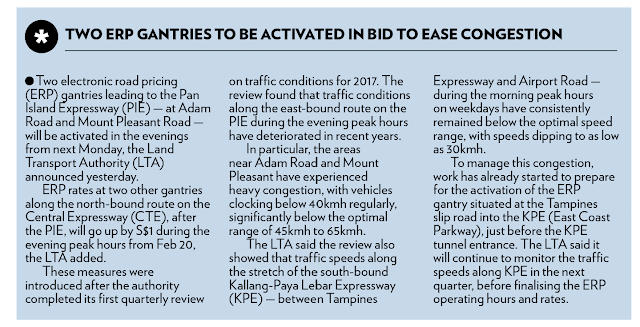 Here's the thing, we have consistently seen the increase in erected ERP gantries and its moderated charges (both up and down) over the years but I really wonder if this is a true solution to traffic problems? While I do agree that mitigating measures such as tolls will help ease traffic to a certain extend, it certainly isn't the true solution to traffic congestion. Tolls, in cities like Singapore would only divert/moderate traffic but not reduce them. Granted that these ERP charges are a way of government revenue as is the Certificate of Entitlement (COE), fuel taxes and road taxes but the crux of the problem will still exist. Yes, we know how everyone feels because rumour has it that the system is 'rigged' in such a way to generate revenue but let's focus on the identified problem. What exactly are these "road reviews"? Are they merely observations based on CCTV footage and collected ERP gantry data? How are these amounts of data put to use? Are these data used to merely fuel the existing ERP models? What's the broad plan for the next 10 years and how does ERP 2.0, the so called satellite-based pay as you travel system integrate with the holistic taxation system of the future to mitigate congestion? I think the Land Transport Authority (LTA) and other relevant bodies should be more transparent to the public in their reviews and enlighten us with a longer term road plan. As the crux of the issue is as they say, traffic congestion, then wouldn't the true solution be plans to build better roads, more efficient highways and intersection traffic control systems? While I truly understand that managing traffic within a highly populated country is a challenge and is by no means an easy task, that shouldn't stop the authorities from innovating and being more transparent to the public on plans, particularly for those affected areas.